Photo by Clemson on Flikr. Click for attribution. I read this passage in a biography of Mao Zedong (yes, I am making my way through all the major historical figures) and started having nightmares about Facebook. This is from the early 1940s, when Mao was consolidating his base for war against the Nationalists. According to Mao: The Untold Story, the Party chairman interrogated vast swaths of his young recruits in order to instill in them feelings of submission and control, and to foster an atmosphere of deep mistrust, as friends informed on each other. That blew my mind a little. 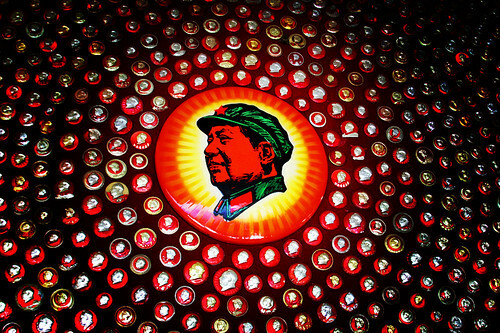 Facebook could do for free what took Mao huge expense and organized brutality. It’s a Stasi/KGB/mukhabarat/CIA dream come true. As this blog’s sidebars should prove, I love social media. But at its worst, can it be a voluntary Panopticon? Maybe the point is irrelevant in a mostly functioning democracy (actually, I don’t think it is), but certainly this historical perspective on state surveillance is relevant to all the arguments boosting social media in, ahem, more controlled atmospheres. One thing’s for sure: no more pictures of any substance on Facebook for me.